I went to the International Festival for Business down at the Liverpool docks to see a presentation on the funding competition for 3D printing by InnovateUK yesterday. I was quickly trapped in a dark room full of suits as the Government man painstakingly powerpointed his way through the process by which they were going to hand over several millions of pounds to the sorts of respectable businessmen who ultimately don’t give a damn if the technology can be made to work productively or not, because the underlying purpose of their job titles is to extract financial profits for themselves as the primary objective. That is the very definition of a respectable businessman these days. It’s not ever defined as someone with the character to manage and inspire the teams of technologists who would have the capability to deliver the technology, or a preparedness to use finance in the service of these ends rather than as an excuse to impose inefficient and ineffective research and development methods onto any program they control. Back in the old days when the Government wanted some new technology developed, like nuclear weapons, space travel or machine tools, people sought out and spoke to the engineers who were ultimately going to have to do the job, and then designed programs around the necessity of organizing these engineers to get it done as efficiently as possible. If their one idea is that people like me have to be subserviently employed under a contract to deliver closed source software for the know-nothing suits they’ve deliberately empowered to curate this technology by virtue of proving them the grants, then it’s going to be a disappointment. I walked out to the main hall where FW de Klerk was being introduced prior to his speech. The structure of his speech began with some broad million-year history remarks about the destiny of the human species and its success through its adaptability to change. And then he dwelt on the unprecedented rate of change happening at the present time. Then, because that’s what he is famous for, he mostly talked about leading the process of change during the years in South Africa when they dismantled apartheid. Finally, he brought it back to providing some advice to business people about change always happening, and avoiding the temptation to go for half-baked measures that only pretend to adapt to the changes, when a total revolution was called for. I was struck by his remarks about handling the risk that South Africa would turn Communist, given that half the ANC top leadership were members of the Communist party at the time. Turns out the South African black leadership was quite willing to sell-out and devolve into one of the most corrupt, nepotistic and incompetent national administrations on the planet. And that’s fine, as long as they don’t do anything irresponsible, like actually redistributing the wealth from the elites back to the people. 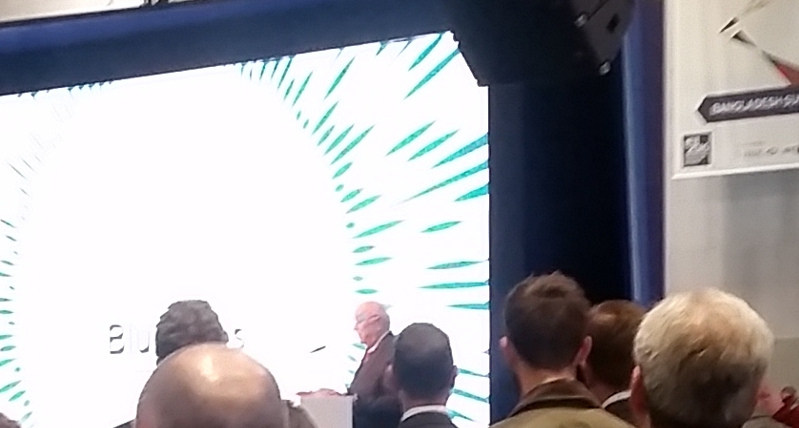 It’s sad, de Klerk said, how much accelerating inequality there is still in South Africa today. But did anyone seriously believe the economic policies pursued were going to lead to a different result? Clue: Name any particular policy that could credibly reduce inequality and it will almost certainly be labeled as Communist. I’d put this object in the museum of the extinction of the human race, in place of BP’s solar powered service station, or the exemplary health and safety record for the maintenance of the Trident nuclear weapons system. Is it the goal of a business education to learn how to focus on the process of a thing or the profitability of an account, and utterly deny the relevance of the very purpose or outcome of the work? For some reason they expect all the rest of the economy to cram itself into the remaining 130million tonnes without complaining because there is no organized people-not-wanting-to-freeze-to-death-in-their-homes-over-the-winter industry lobby to fight back against their disproportionate stake. 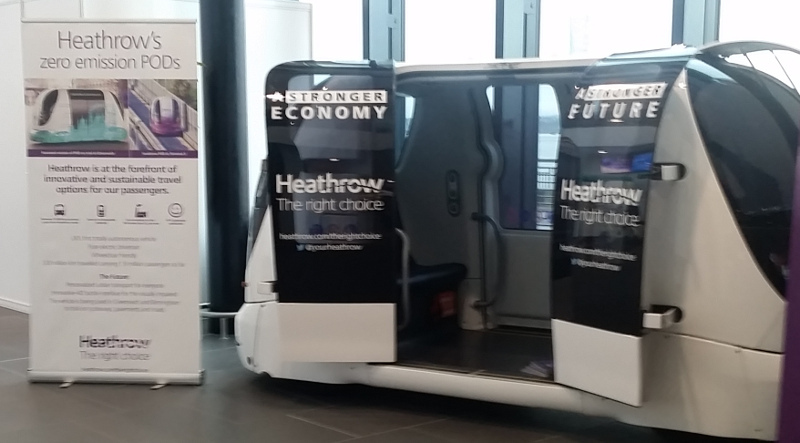 And this expansion includes their crackpot growth into regional airports between cities where trains that can run on renewable electricity already exist! 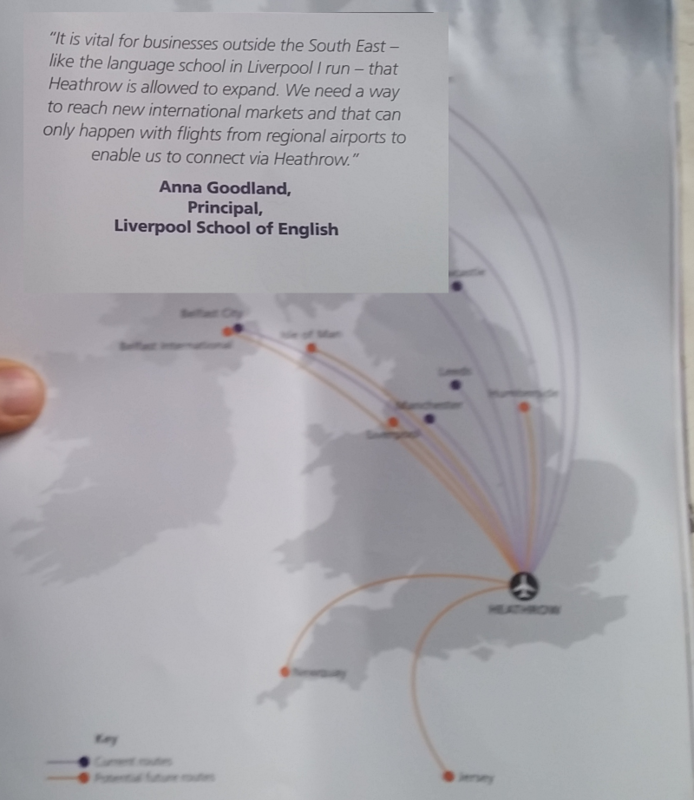 And what example case of need for this flight path between London and Liverpool do they exhibit in their brochure? The service of teaching English — which I know for a fact is effectively delivered in some form in probably every single city and town in the entire world. They might as well have taken a quote from the sourdough bread shop owner around the corner, claiming that Germans ought to fly over from Munich in the morning to collect their bread because they like the taste of it. It’s double-think. 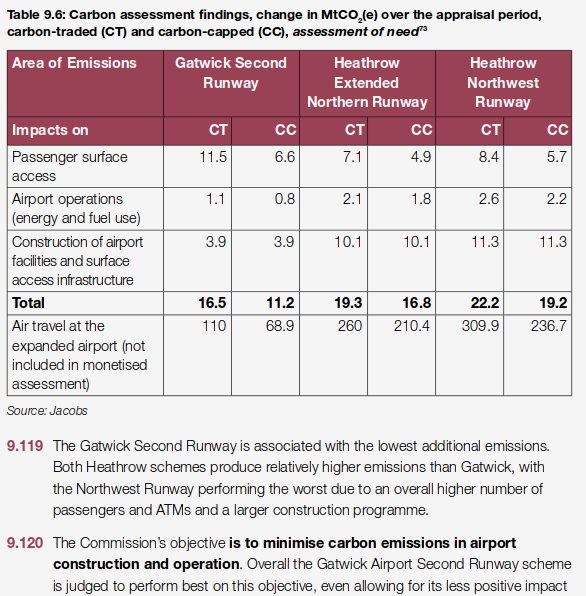 This goddamn feather-bedded industry involved in an elaborate superficial con-job, explained on page205 of the 344page Airports Commission report everything now refers back to, where it says we don’t count the carbon emissions facilitated by the expansion of the airport. 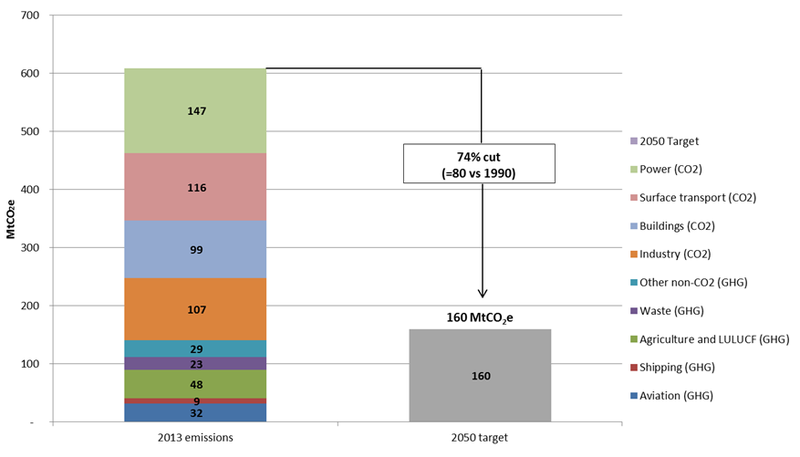 In a world where there has been a 90% cut in fossil fuel use people won’t be going on easyjet weekend breaks to Benidorm — if that’s what’s implied by their air travel demand forecasting models. How can anyone seriously believe that such a world would look anything like it does right now? de Klerk might say that this is a prime example of just pretending to change and not taking account of what it really means. We don’t have time to play this game the slow and ineffective way of pandering to the ignorant narrow-minded business leaders who got us here in the first place and are demonstrating zero awareness of the magnitude of the change. But, as with developing new technologies fast enough to make a difference, Governments continue to be stuck in the mode of talking only to these gets like it’s going to work out well in the long run.